As I watch the actions of this president I have come to the conclusion that he suffers from arrested development, displaying qualities more akin to that of a child than an adult. What are the qualities and traits that a person develops as they mature into a functioning adult that are not innately present in a child? A child is helpless upon birth and totally dependent upon adults to feed, bathe, clothe and nurture him, so an infant is predisposed to selfishness for survival. A crying child can indicate hunger, cold, illness, in other words, a child needs to get attention so that his needs are attended to. Over time, as the child grows, a good parent should wean the child away from selfishness to self sufficiency, to develop concepts like reason and critical thinking, and to learn selflessness, acceptance of responsibility for personal behavior, truth telling, humility, and to use his continuing experiences throughout life to re-evaluate his beliefs. In addition, the child should be instructed to drop bad traits like petulance, stubbornness, self-centeredness, dependency, denial, and lying. And although creativity and fantasy are wonderful aspects of childhood, unbridled fantasy in an adult is not healthy. But this president didn’t appear to receive such guidance and is the product of the left’s self-esteem movement. He has been socially promoted and has received special favors throughout his life. He is physically a man, but has been coddled and allowed to continue to live the life of a child. In spite of the fact that it is a leap of fantasy to believe that the American economy can flourish without an abundance of petroleum and coal and in spite of evidence to the contrary, the president does not employ the power of reason tempered by experience. He and his childish fellow travelers on the left continue to cling to the notion that carbon based energy can be replaced with solar and wind power in spite of all of the well documented failures of these technologies. Another example of fantasy driving policy is his desire to eliminate America’s nuclear capability, a misguided notion of the left for decades. That other nations, bad actors all, are creating nuclear weapons and delivery systems is of no consequence to this president, who ignores reality and is pursuing his fantasy of a nuclear free America. Tossing the keys to the White House is like tossing your car keys to your 4 year old and jumping into the passenger seat. Both are woefully inadequate for the tasks at hand. Although the left are hyper focused on ‘Bullying’, decrying it and even legislating to criminalize this childish characteristic, the President uses bullying to advance his agenda without hesitation. He gives or withholds love to groups of people in order to manipulate them to do his will. This resembles the cliquishness we all experienced during our High School years. The Health Care Bill was a prime example of the bullying tactics the president used to get reluctant members of his own party to support and eventually pass the legislation that later cost many of them their jobs. But the bullying and selfishness doesn’t stop there. His treatment of Paul Ryan, Gov. Jan Brewer of Arizona, Gov. Bobby Jindal of Louisiana, Gov. Rick Perry of Texas, the Tea Party movement, the business community, the military, and the energy sector are all examples of how a stubborn, petulant, and selfish child behaves. One of the primary roles of a parent is to make sure their child is truthful and this is probably is one of the most difficult qualities to instill, as lying successfully can get one out of a jam. Obviously, Obama’s mother didn’t do a very good job on this. At this point in his presidency you must filter through endless lies to find the occasional nugget of truth that might slip out. Teaching a child that other people’s private property is sacrosanct, that they cannot simply take the property of others because they desire it, is another of the challenges of parenting. Jealousy and thievery are inherent in most children and combating those tendencies takes discipline and diligence. Honesty and the civil society go hand in hand. A president that foments these instincts within the populace is not only dangerous; it’s criminal and teaches that it is acceptable to use any means necessary to acquire the property of others. It causes discord, resentment, and division. It is class warfare. A president that embraces the tantrums of the Occupy Movement proves that he reasons as a child. A president that uses the power of his office to steal on behalf of others proves that he was never taught the most basic lessons of how a civil society functions. If every member of society behaved this way our country would appear more like the post-apocalyptic world of the Mad Max movies. 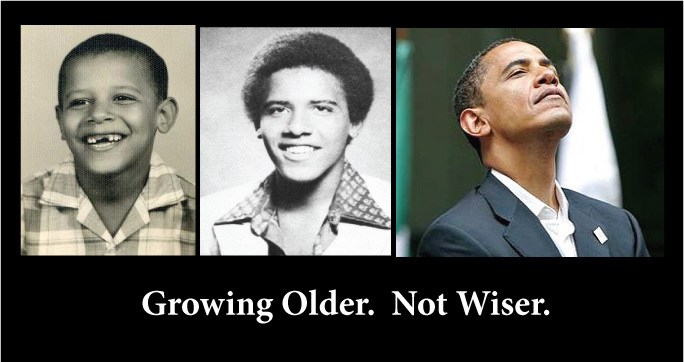 It’s time for the adults in this country to put Obama in the corner and give him a time out. Take away his privileges and ground him in November.